A quick search of wild duck recipes will reveal a lot of recipes that attempt to mask the flavor of a duck. I'll be the first to tell you that if you are trying to mask the flavor of duck you are cooking it wrong! Ducks don't need to always be wrapped in bacon, smothered in sauce, or otherwise extremely doctored up. That being said this recipe isn't for all species of birds since they all have a little different flavor. Mallards and wood ducks are my preferred species to use with this recipe. So here we go, this one is simple but is sure to impress your taste buds and your guests. First off, you need the right ducks. Birds without pinfeathers are what you are looking for (mature birds in mid to late season typically work well). You also don't want birds that are shot up. Ideally you want to use the whole breast without having to cut wound channels out. So finish them in the decoys and shoot them in the beak. Once you've harvested some ducks simply pluck the whole breast area and then remove the breasts with the skin still on. I also like to take a blow torch and burn off any of the remaining fuzz at this point. From here birds can be frozen, aged for a few days, or you can start cooking them after they have been breasted. Now when you cleaned those birds you made sure to save that little strip of meat that is the inside tenderloin right? Remove those from the breasts or, if you haven't already, put them in a plastic bag with a bit of olive oil and a liberal amount of the Reel 'n Smoke seasoning (it has just the right amount of salt and spices) . These can either be treats for the chef or can be shared if you are feeling generous, they are the best part of the whole bird! Pat duck breasts dry and score the skin in a cross hatch pattern. Slice through the skin but not the meat, this helps the duck fat underneath the skin render. 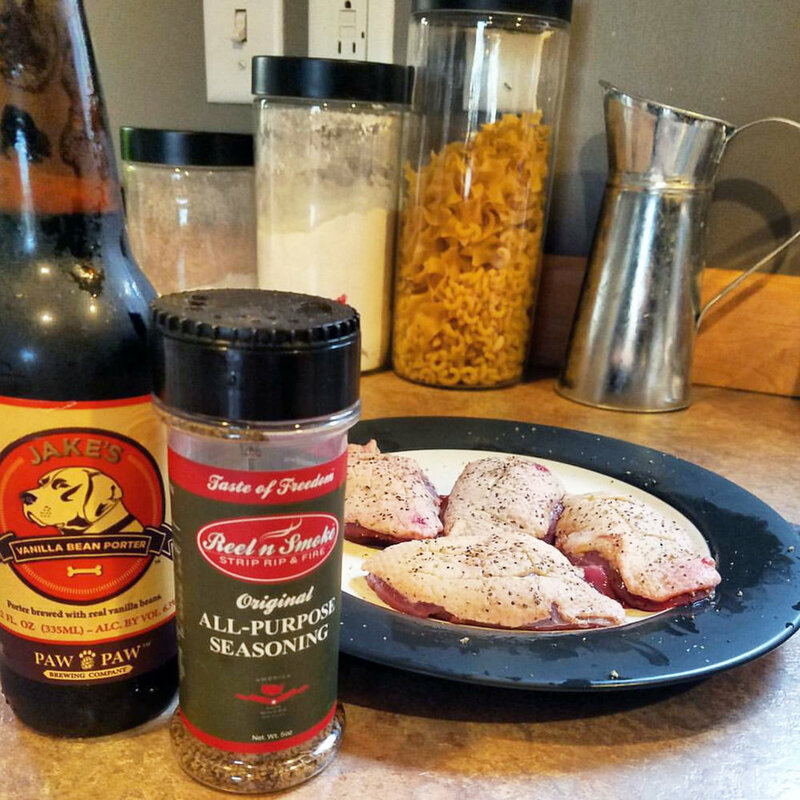 Apply a liberal amount of Reel 'n Smoke seasoning to both sides of the duck breast. Also I've always found letting meat adapt to room temperature for a half an hour makes it is easier to achieve the proper level of "doneness" throughout. Add olive oil and heat the pan on high for a minute or two then add the duck breasts skin side down. Reduce the heat to medium/high and let them cook for 6 to 7 minutes depending on the size of the bird. You'll also want to add those tenderloins, cook them for about a minute on each side. Add toothpicks to the tenderloins, plate, and serve as an appetizer. They won't last long! Flip the duck breasts and sprinkle a bit of salt on the skin, this will help it crisp up. Also since the breasts are uneven you'll need to use a pair of tongs to sear all sides of the duck breasts. Cook on this side for another 4 to 6 minutes to achieve a medium rare doneness. Time and heat may vary based up on your heat source and the size of your birds. However do everything in your power to not let them get past a medium doneness. Let the duck rest for a few minutes, plate, and serve! You can get fancy and pre-slice the breasts before they are plated, or serve them whole. Grab a glass of red wine, or a Michigan made craft beer and enjoy! You'll notice the skin is nice and crispy and the rendered duck fat/skin adds a whole new flavor to things. Perfect this recipe and you'll realize you don't have to wrap ducks in bacon for them to be delicious.